It was a dark and stormy night. Inside the castle, the notorious Dr. Leys was busy working away in his laboratory. Either by serendipitous discovery, maniacal experimentation, or exhaustion brought on by long bouts of feverish fractal rendering — an Ultra Fractal parameter file fell into the POV-Ray Raytracing program …and began to grow. 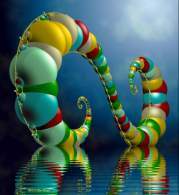 I’ve always liked Jos Leys’ shiny and colorful fractal images (are they really “fractals”?). I noticed especially that a write- up of the Benoit Mandelbrot Fractal Art Contest 2006 held in Madrid, Spain (in Europe) featured prominently Jos’s image, Indra’s Pearls in it’s title spread. Jos’s work has a very polished professional look which I’m sure appeals to many people — something which didn’t go unnoticed with the writers from El Pais, I suspect. It would be easy to dismiss work like Jos Leys’ as nothing more than eye-candy with it’s bright colors and shiny balls, but unlike most examples of eye-candy, Jos’ images have a unique style that preserves the wonder of Fractal Art and at the same time presents it in tasteful elegance. The fact that Jos’ work is so captivating and yet seems to come from just a very small section of the formula spectrum shows how creative it really is and that it isn’t just endless repetitions of a worn-out theme. (Above) Kill it before it breeds! (Above) So simple, so colorful, so wonderfully “Jos Leys-ian”. (Above) I like the shadows in this one. Remember, it’s ray-traced; even the shadows are drawn by the program and determined by where the user sets the light source. What else is there to say? There’s a beautiful sense of proportion and shape to these images. But of course that comes from the math. Rather than belittle Jos for this, he ought to be given extra marks for not interfering with the natural artistry of the formula. (Above)You’ve got to have real talent to be able to take one of the cheesiest effects of all time, “Lake Effect”, and make it look sublime. I’ve really come to hate Lake Effect, but for some strange reason it looks great here! Yes, if Jos can use Lake Effect and it still comes off looking great, then he really does have Super-Powers. 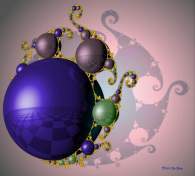 And how come there’s only one Jos Leys in the Fractal Art world? 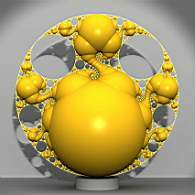 What have the rest of you Ultra Fractal folks been doing? Eating Kryptonite? 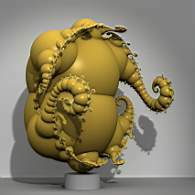 Jos Ley’s style has often been tried and imitated, but never perfected by anyone else I’ve seen some uses of raytracing and Indra’s Pearls, and even have done some myself. Still, I can never get the results Ley has. These are tough colorings and formulas and it takes a lot of work to get them right. Ley has done this. The POV-Ray stuff is cool, too. The second one reminds me of a fractal Thanksgiving turkey.